VeriCite DocumentationUser GuidesLTI User Guide Instructor ArticlesHow do I manage users and user roles in VeriCite LTI? 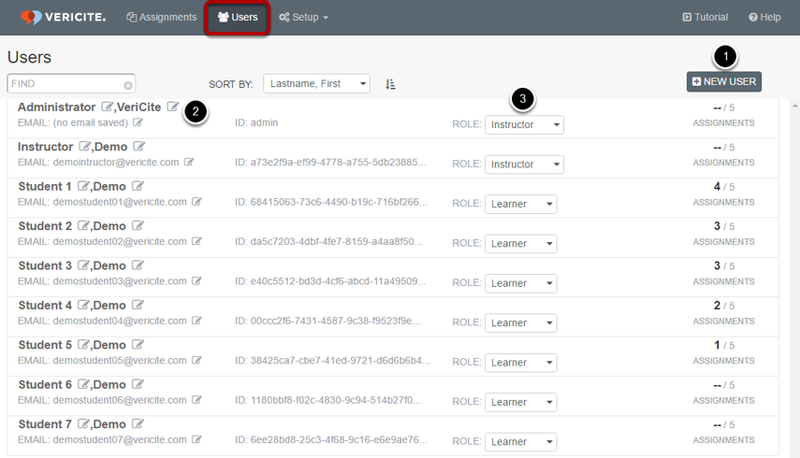 When users are enrolled in your course, they will automatically be added to VeriCite with the default permissions appropriate to their role in the course (i.e. student, teaching assistant, or instructor). However, if you need to modify a user's information or role in VeriCite, you may do so from the Users area. Go to the Users menu. Zoom: Go to the Users menu. The Users area allows you to add new users, update user information, or change a user's role. To update the First Name, Last Name, or Email for a user, click the Edit icon next to the item you want to change. Select the Role drop-down menu to change the role for a user. The role will determine which set of permissions is assigned to that user. You can select from Learner, Teaching Assistant or Instructor roles. Prev: How do I view all submissions for a particular user? Next: How do I navigate a VeriCite LTI report?